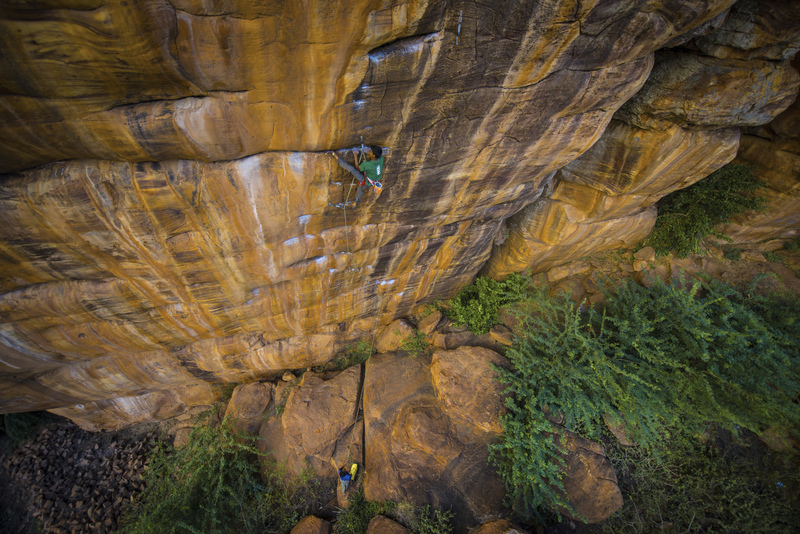 In India, the climbing route Ganesha (8b+) in Badami, is a pilgrimage for addicts of sport climbing. As of January 2015, its reign as the hardest sport climbing route around was continuing albeit insecurely, for two other routes had emerged and their complete ascent was all that stood between them and the crown. En route to Ganesha (aka Ganesh), before the path winds up to the crags of the Temple Area, in a house, the last one on the left and opposite the Mallikarjun School lives the other Ganesha. The first time I met Ganesha Waddar showcased the strange coincidence of two similar names in the neighbourhood. 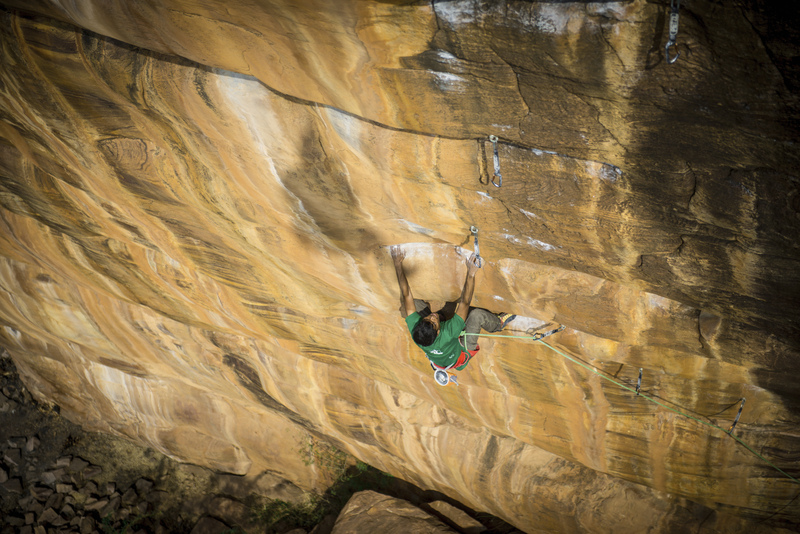 It was early 2014 and I was in Badami to write about the climbing around Ganesha 8b+. As I approached the Temple Area, a youngster said hello. “ Are you a climber?’’ he asked. I laughed and gave him the accurate answer: I was once climber, now a shadow of it. He introduced himself as a climbing guide of sorts and asked where I was headed. “ I am going to Ganesha,’’ I said. He seemed a good sort to talk to. “ What’s your name?’’ I asked. That chance encounter stuck in my mind. It was now January 2015; time to hear the story of the other Ganesha. We were in a small, busy restaurant in Badami. 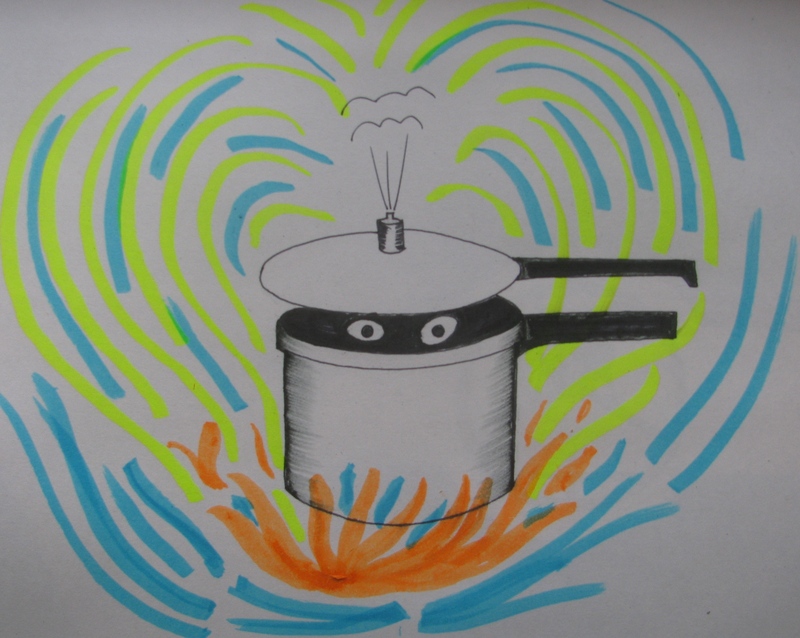 It was noisy outside; noisier inside. Not a great place for coffee, except, the coffee was really good. Ganesha and Shivu Waddar, both 19, sipped the piping hot brew. Ganesha is the youngest of four brothers. His father, who Ganesha said used to be a small time contractor doing civil work, died a year and half ago. The youngster, having completed studies till the tenth standard was technically into first PUC (pre-university course). However he had been away from studies for the past two years. Situated as his house was on the local stairway to climbing’s heaven, Ganesha grew up seeing climbers. He used to follow them and watch what they did. “ Back then, my English was very bad. I couldn’t communicate. Eventually I managed to tell them of my desire to climb,’’ he said. The first climber who indulged this wish and got him started on climbing was an American. This was over three years ago. As I learnt late in the day, for better climbers knew it earlier than me, Badami has its crop of young, home grown talent. 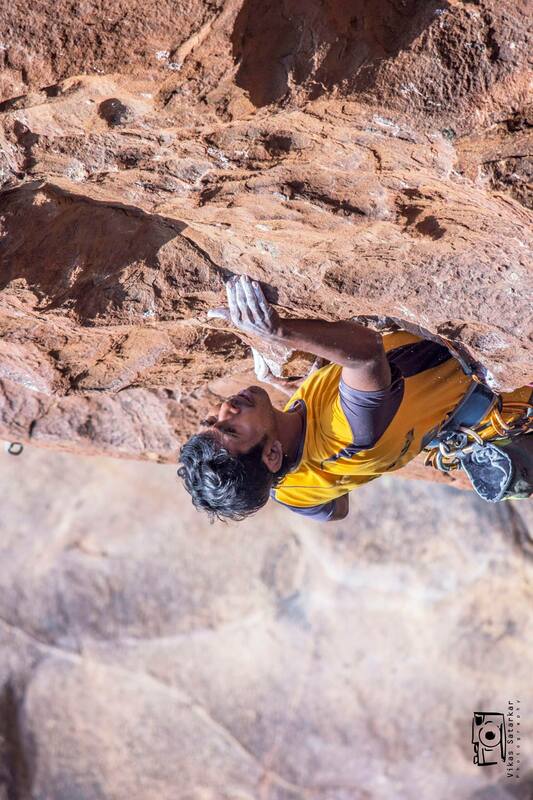 During a conversation with Kumar Gaurav, one of India’s best upcoming climbers, he had mentioned of Ganesha and Shivu, among others, as those he had climbed with during his training trips to Badami. 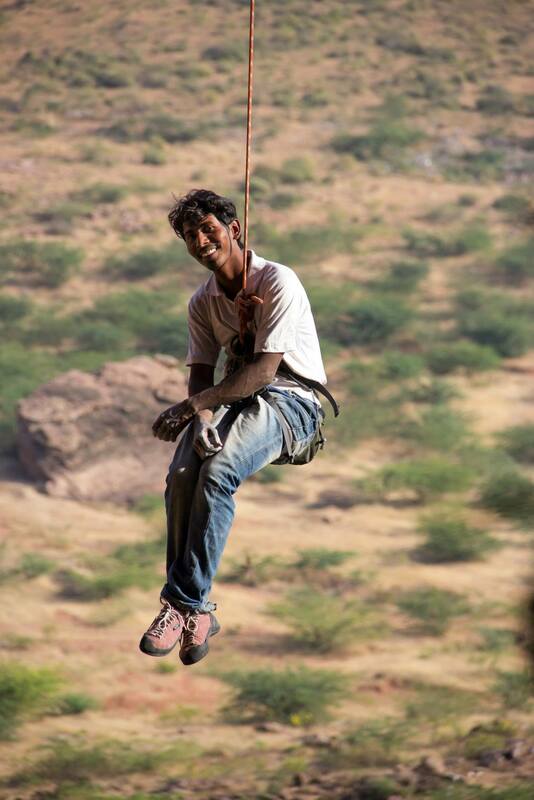 They belayed Gaurav while he was visiting Badami and training alone. It was evening and the restaurant was crowded. Ganesha had been trifle fidgety as though waiting for somebody. He now relaxed. A small, light youngster approached and sat down, the third person on the restaurant bench before me. Meet Manju Waddar. By the time I reached Badami in 2015, Jyothi Raj’s film – Jyothi Raj alias Kothi Raj – had come and gone. Some of the climbers in town had seen it too. Based in Chitradurga and a regular sight climbing the fort walls there, Jyothi Raj’s story is well known in Indian climbing circles. According to Ganesha, it was Joythi Raj who advised him to participate in the south zone climbing competition, a move that at the very least would get the youngster out of Badami and into a bigger world. He competed in the 2012 south zone competition and finished a creditable fourth, sadly just outside the selection level for the national competition. The experience was slightly different for Manju. He had moved to a house some distance from Badami. 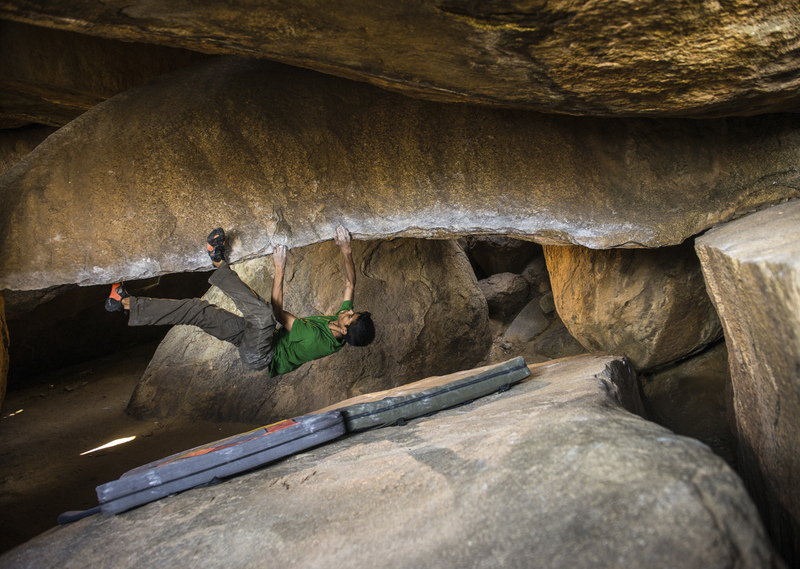 Manju, 16, used to be Ganesha’s neighbour; that’s how he got into climbing. His father too is engaged in civil construction work. 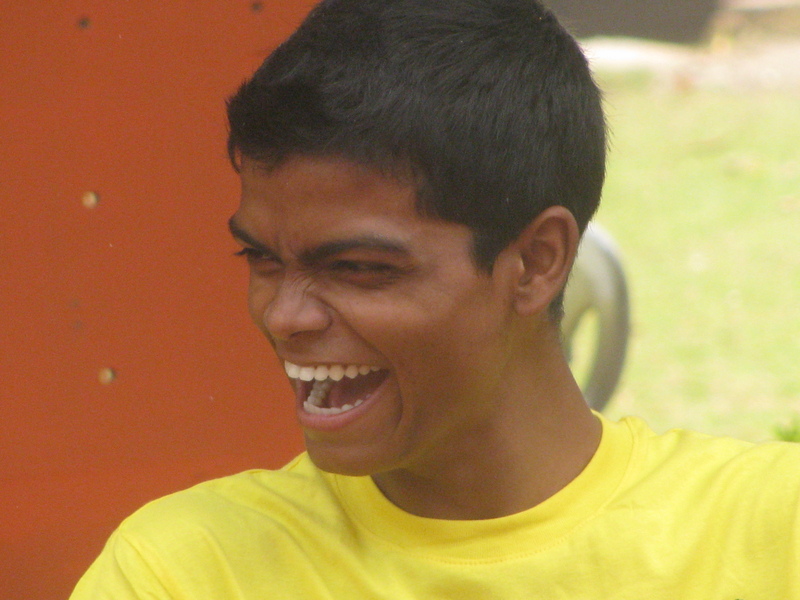 Manju studied till ninth standard; his education has been erratic owing to financial strain. To make ends meet, he works in the construction line. Apparently, Manju was also nudged into participating in the south zone competition by Jyothi Raj. Manju finished third at the south zone competition and ninth at the nationals. He has a lingering fancy for competition climbing while Ganesha prefers a non competitive format. 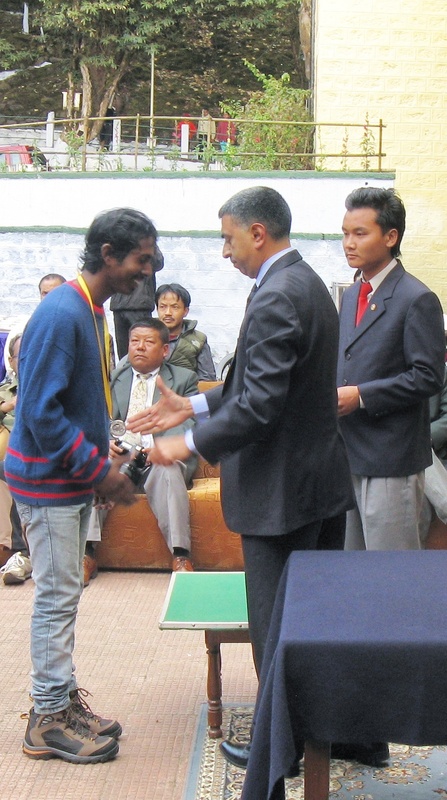 In 2014 Ganesha did his Basic Mountaineering Course from the Himalayan Mountaineering Institute (HMI), Darjeeling. Poonacha Madappa, a well wisher then based in Bangalore, filled in his application form and provided funds. Foreign climbers provided trekking shoes and backpack. He finished his course with an `A’ grade. He would like to do the Advanced Mountaineering Course. 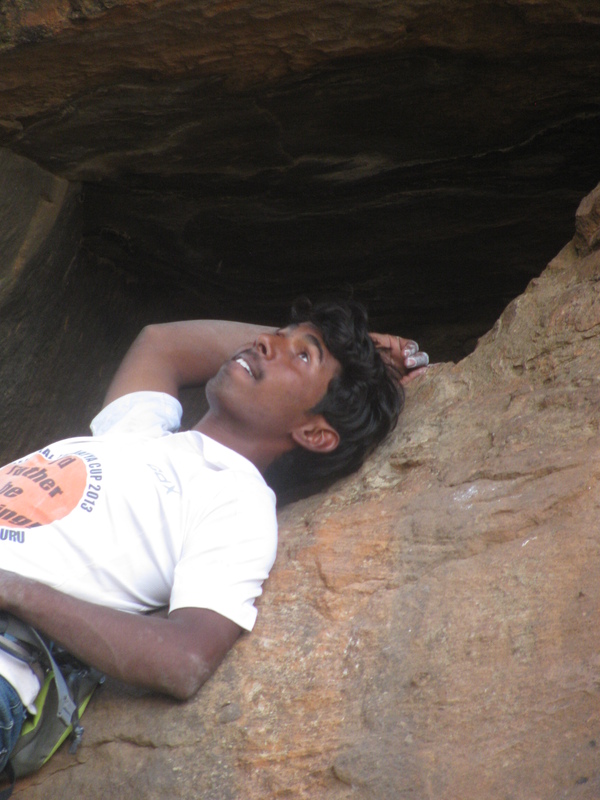 He and Manju now feature on a website (http://climbingbadami.in/) offering help to visitors wishing to climb in Badami. It was set up two months ago (which would mean the closing part of 2014) by a Swedish couple who are into climbing. In Badami, Ganesha had helped them. Indeed days after I first met him in 2014, I saw him climbing with a visiting group of young climbers from India and overseas, leading a route and then setting up a top rope for them. The hardest route Ganesha has led was a 7a. He felt that Manju, who is a strong climber, should be around 7b. They often work together as a team. Shivu, 19, also helps Ganesha. Over time, foreign climbers passing through have given Ganesha a small cachet of used equipment – some ropes, quick draws, helmets, harnesses. He would like to add to it some new equipment. Money remains an issue, although Ganesha periodically works, including work away from Badami. Shivu would like to continue his studies. Manju wouldn’t mind more competition climbing and hopefully, a job in climbing or one linked to it. At my question on what he wished to do, Ganesha thought a while. “ Two years back I didn’t have money. Now it is a little better. I wish to study and also improve my climbing,’’ he said. That’s the story of the other Ganesha. The first time I heard of Martin Moran was in the Pindar valley. Couple of villagers mentioned his name. I heard his name mentioned there too. Later when the first Indian ascent of Changuch happened, Martin’s name was firm reference point for his expedition had recorded the peak’s first ascent. That in turn, was the fallout of a climbing trip to Nanda Devi East, which he chose to abort and redirect towards Changuch. Before Nanda Devi East, Martin had been up Baljuri and Panwali Dwar. These are not just engaging mountains. They fall at a junction in geography and spirituality that is important to Garhwal and Kumaon, particularly the latter. Knowing who Martin is and what his body of work is, appeared essential. When the chance to review his book emerged, I was delighted. 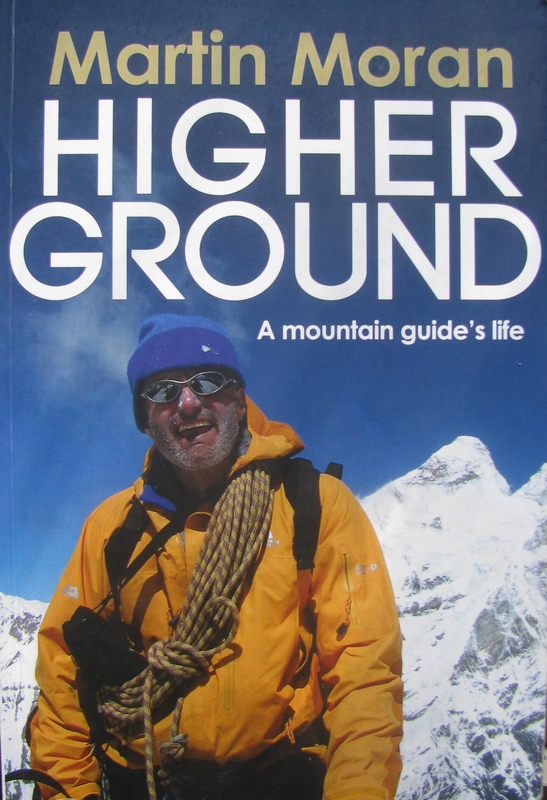 `Higher Ground – A Mountain Guide’s Life’ was a mixed package. Its strength is that it gives much insight into the subtitle. It is required reading for anyone aspiring to be a mountain guide. If you are imagining a book with details on a plethora of knots and anchor systems – a sort of technical manual; you are mistaken. Martin’s book is his life in guiding, shared. It does not unduly play up the usual lot of technical information, which the term `mountain guide’ evokes. Instead, it provides a taste of how the guide sets up business, works with clients, how much the envelope is pushed for achievement on trips and most important – how even a guide of considerable experience like Martin, won’t hesitate to turn back if conditions on a mountain are bad. If I may say so, there is much relevance in India to reading this book because in the Indian rat race, admiration for being superhuman and the compulsion to be superhuman are both high. They are among sentiments shaping our perception of climbing. Ahead of being comfortable with climbing, it is unfortunately seen as achievement. Martin’s book, although unashamedly nurtured on a diet of climbing, does not hesitate to talk of mistakes, accidents, long days that he and clients got away with and mountains that seemed wiser to behold from far. High altitude isn’t everything. There is much to keep you busy at the lower heights. Martin’s book introduced me to peak bagging in Scotland; of clients returning to accomplish the ascent of a cherished number of these peaks. Equally, the book also lays bare how the mountains of Scotland and the Alps of Europe can be laboratory for eventual success in the Himalaya. You don’t find this said as such; you glean it. Nearly three quarters of the book obsesses with specific routes and climbs in Europe, something that can tire a reader unfamiliar with these environs. But in the end, you see the organic link, the making of competence. You can definitely do the same in the Himalaya (as many from Nepal and India’s mountain states do) but the point is – there is no substitute to being out and climbing. In the outdoors, you are only as good as how frequently you are out. Indeed Martin’s book is a freight train of personal climbs and climbs done with clients. So much so, it is sparse on his personal life. From a reader’s perspective, the book is a challenge given three quarters of the book dwelling on the Scottish highlands and the European Alps (with some mention of Norway in between) and the difference in character between narratives from there and the Himalaya. It is a tough contrast to bridge smoothly. Europe’s mountains, heavily climbed and well known, bristle with technical information. Despite best effort to tell a story, accounts of climbing feel dry. I felt the book’s first three quarters was a stiff narrative that could have been made gentler for folks like me. I started enjoying the book from the last quarter. That’s when Martin reaches the Himalaya. 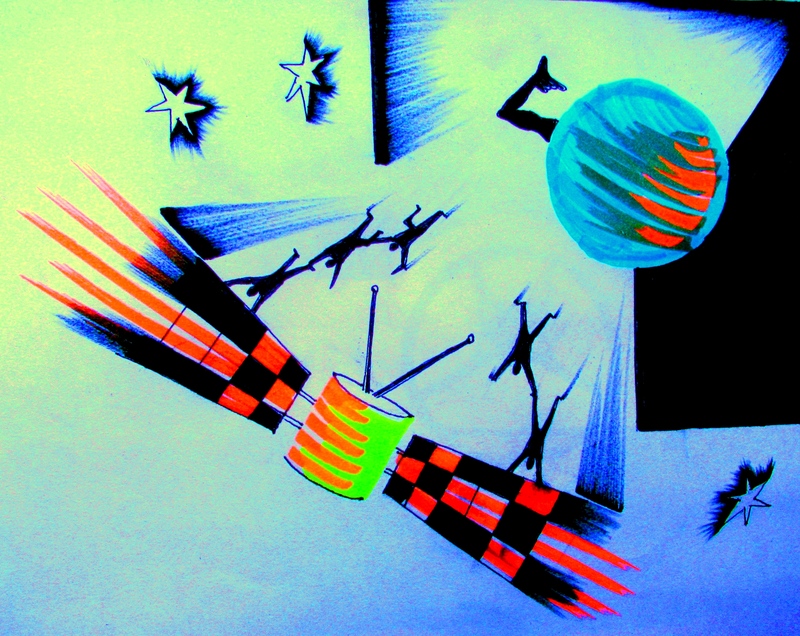 With its unique matrix of mountain dimension, altitude, spirituality and people amid it all, narratives from the Himalaya are by nature different from stories from Europe. Couldn’t Martin have kept the style of narration uniform – either the texture of Scotland and Alps all the way or the texture of the Himalaya all the way (as I would prefer)? Or, mixing up the chapters in a non linear fashion? I wonder. All I will say is – I laboured through the first three quarters of the book and enjoyed the last quarter. The book’s other weakness is exactly what it delivers as its strength. If you prefer the non commercial context as ideal window to the mountains, then this may not be your cup of tea. 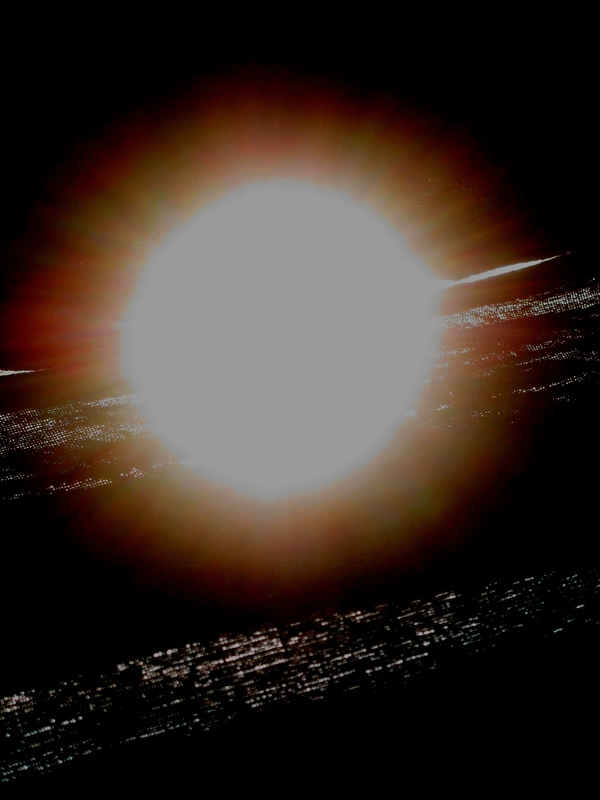 It shows in the rather limited ruminations on life and life’s questions that dot the narrative. This book is about work. It is worth reading, especially if you are mountain guide or aspiring to be one. 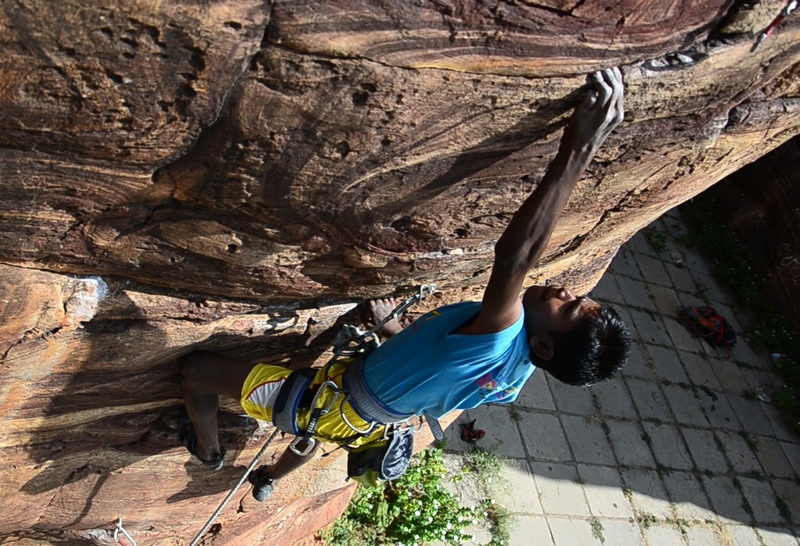 Girivihar, Mumbai’s oldest mountaineering club, hopes to hold a world cup in bouldering, in 2016. The event will be in Navi Mumbai. 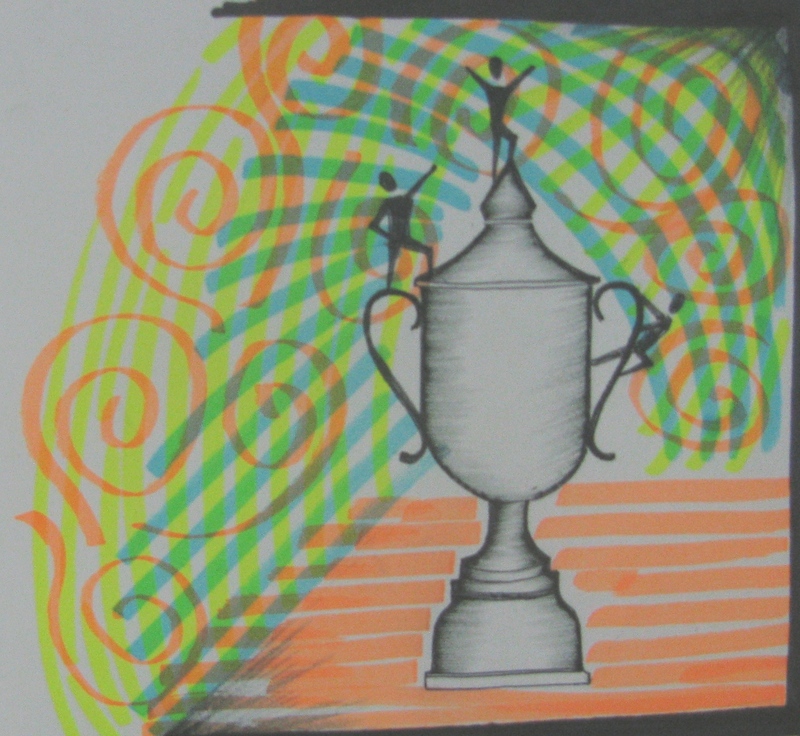 India has never hosted a world cup in climbing, before. Moves for a world cup here have been on for some time. 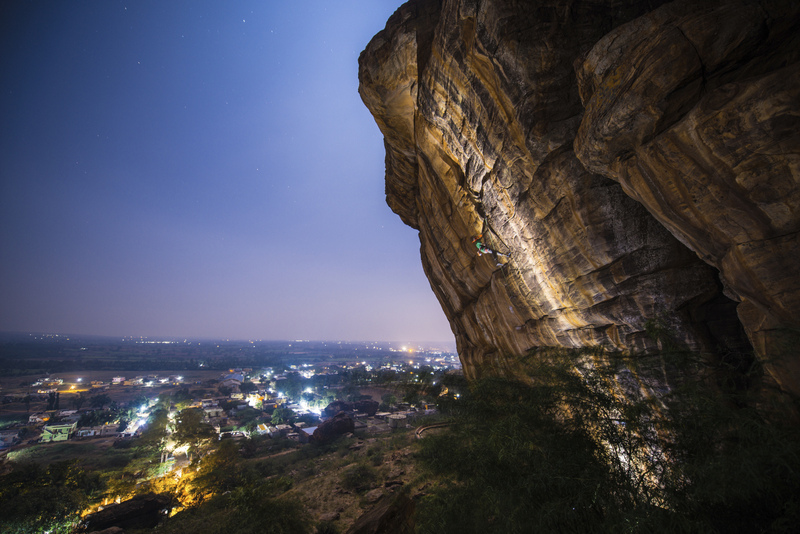 The idea can be linked to Girivihar’s track record in conducting an annual sport climbing and bouldering competition in Navi Mumbai for the past over ten years. This event grew steadily; it attracts climbers from India and overseas. Although it started as a bouldering and sport climbing event on natural rock, it progressively transformed to being a bouldering competition on artificial climbing walls. 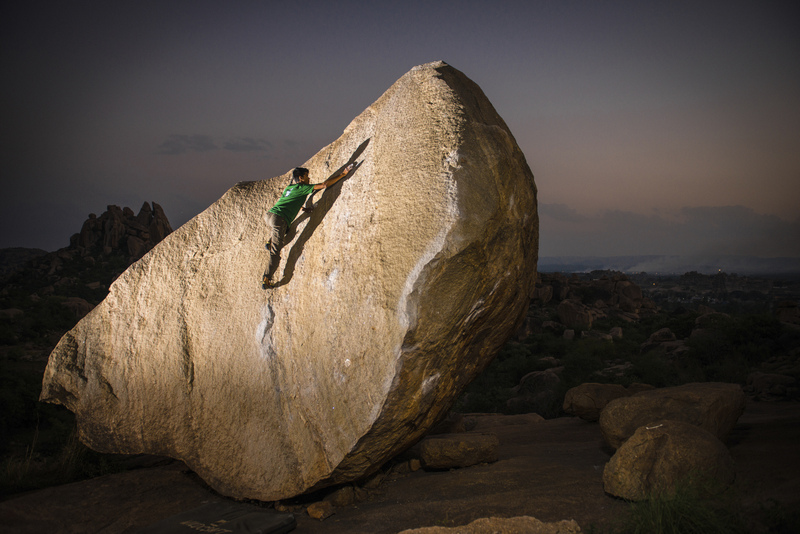 “ We are aspiring to host the 2016 IFSC Bouldering world cup,’’ the club’s latest circular said. According to it the Indian Mountaineering Foundation (IMF) granted provisional clearance for the project in November 2014. Should Girivihar’s application be confirmed by the International Federation of Sport Climbing (IFSC), then it will have to submit the required application fees. Alongside, the club has disclosed plans for an Indian national bouldering team that will participate in the 2016 world cup. This plan includes a comprehensive training program for the team. Needless to say, such steps like the application process, training of the team, a proposed road show to publicize the world cup, prize money and the event itself, will entail considerable expense. The circular mentions a fund raising effort. Earlier, it was separately understood that the annual bouldering competition which used to be held every January at Belapur in Navi Mumbai, won’t be there in 2015 as the organizers have shifted their attention to the planned world cup.